I was delighted to try out these gel style top coats, mostly because I love beauty on a budget and if I can find something that I can do cheaply at home rather than pricey trips to the salon, then I'm all over it. Also because I've found that I rarely even bother applying nail polish anymore - with my lifestyle it's chipped, dented or 'smooshed' (yes that is the technical term) within hours. And that's after waiting over 30 minutes afraid to scratch my itchy nose in case I damage it, along with the usual trick of immersing my shivering digits in icy cold water. And a top coat. This is a compare and contrast number so let's get down to the nitty gritty. 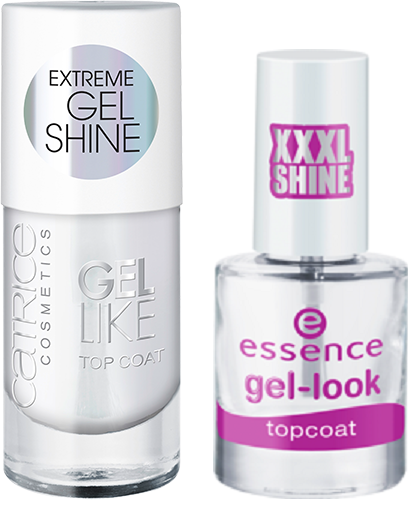 I applied a coat of Catrice Gel Like Top Coat to the nails on my left hand, Essence Gel-Look Topcoat to the right. For the record I am right handed but I personally find that both hands are equally as busy and the polish on each seems to diminish somewhat around the same time usually . Both varnishes were applied over one coat of Angelica nail polish in Temptation (I don't do layers, it never bodes well for me). Firstly the applicator brushes. I much preferred the Essence brush due to the fact that the bristles were softer and slightly fanned at the end, allowing more varnish to be loaded. The Catrice brush was cylindrical with bristles that were a little stiffer thereby requiring more strokes to cover the nail. Boo to extra work! The solvents in nail varnishes can take up to 24 hours to dry completely but should be superficially dry or "touch dry" in 30 minutes or so. 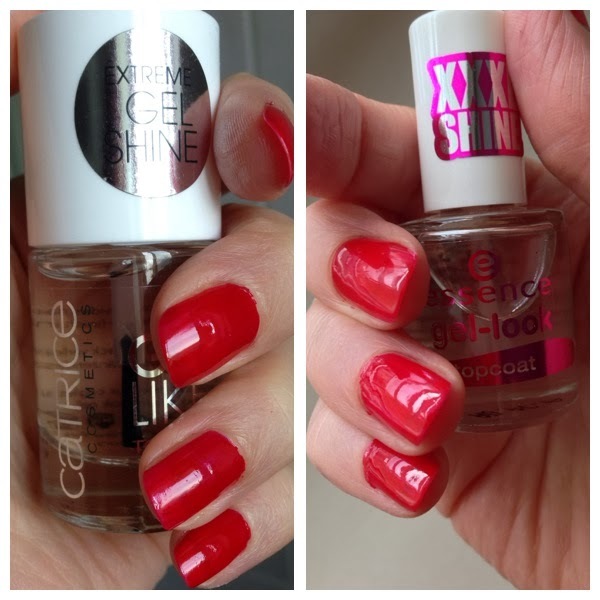 I noticed that the Catrice dried faster but also deepened the colour of my polish. Barely perceptible and it didn't bother me but it may well be worth bearing in mind. Also it didn't deliver the "Extreme Gel Shine" that the bottle promised. It was glossy, but not gel glossy. The Essence offering had every bit the "XXXL Shine" the bottle declared. However, annoyingly, this 3D gelly-glossy loveliness dulled within about three hours. It was still glossy but not the extreme amount it started out as. This was due largely to the fact that hours after application the Essence nails were collecting little dings and imprints (and texture means a duller finish), even while I was being reeeeally careful. And anyhow, who has time to sit around for hours literally waiting for paint to dry? I intentionally tried to dent the Catrice varnish at this stage but that baby wasn't budging. Durability wise I was very impressed with both. I'm a very hands-on individual, what with playing with lego, doing jigsaw puzzles, playing with the kids, cooking, housework, typing on the computer, painting pictures (I'm an artist by trade)... I'm not usually the one with a lasting manicure I can assure you, but I am now on day six of the trial and there are only tiny chips at the nail tips. Usually at this stage I would be far too embarrassed to have my ragged talons on display in public. These are certainly more hard-wearing than your average top coat. Would I repurchase? Yes, and I think it would be the Catrice Gel Like Top Coat that I would reach for. Although not as glossy straight up, I felt the finish looked quite professional. What I saw is what I got, it looked good on my nails, dried quickly, stayed put and was reliable (sounds like a lonely hearts ad). Look here for more info on the Catrice one, and here for more info on the Essence one.